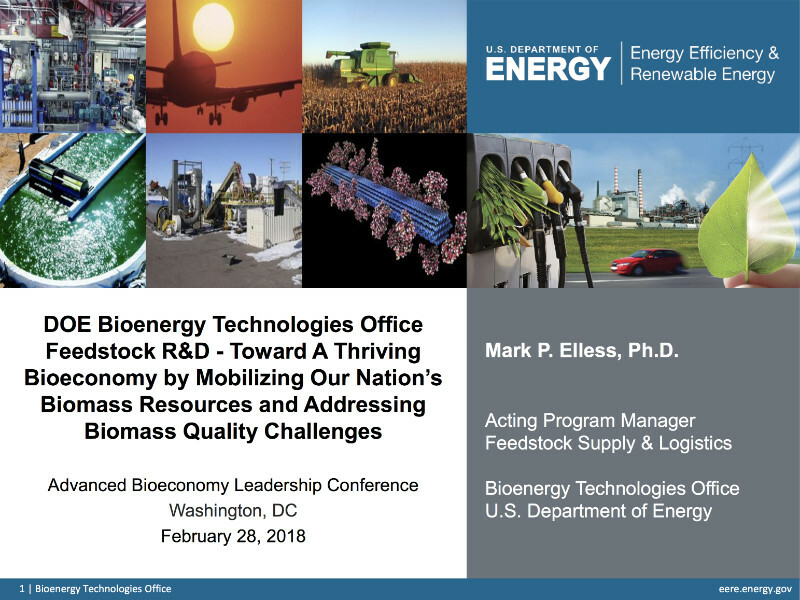 “Toward A Thriving Bioeconomy by Mobilizing Our Nation’s Biomass Resources and Addressing Biomass Quality Challenges,” that the ambitious title of this illuminating presentation from the DOE Bioenergy Technologies Office’s Feedstock Supply & Logistics team. The focus, to fully integrate feedstocks into supply chain (multiple interfaces). reform raw biomass into high-quality feedstocks. use innovative technologies to ensure sustainable supply and reduce costs. and reduce risks to enable industry expansion. The DOE has been in the lead on this topic for some time — who knows where we’d be without the driving support? The acting director for Feedstock Supply & Logistics, Mark Elless, summed up the state of play in a must-view presentation he gave at ABLC 2018 in Washington, DC.